But, back to your beloved bathroom and breathing easier! The good news is healthy alternatives to nasty PVC options do exist. We recommend hemp because it is naturally resistant to mildew and bacteria and can be machine washed. It also doesn’t require a plastic liner. Yes, they will cost you a bit more (but, you’re sooo worth it!). Here are some of our favorites. Let us know if you have a fave in the comments below. Earthsake $119.00 – 100% pesticide-free Romanian hemp shower curtain. Does not require a liner. Resistant to mold and bacteria and dries quickly. It is machine washable. GreenHome $105.00 – Romanian grown hemp which is grown without pesticides and chemical fertilizers. The shower curtain will get wet, but will not leak through. natural resistance to mildew and bacteria, and can be machine washed to clean any grime buildup. Rawganique $42.50 – $109.00 – Made from 100% organic European hemp grown. Sweatshop-free. PVC-free. Plastic-free. BPA-free. VOC-free. Dioxin-free. Metal-free. Use with or without a liner. Coyuchi $214.00-$236.00 – Can be used with or without a liner. Earthsake $126.40 – May be used with a liner or without-just squeeze the water out of the lower edge after use and let it dry. Hangs from rustproof metal grommets. Cotton/linen is made in India from flax grown in France and Belgium, and 100% organic cotton from India. Coyuchi $158.00 – 100% organic cotton. Can be used with or without a liner. Coyuchi – $162.00 100% organic cotton. Can be used with or without a liner. GreenHome – $82.14 100% Certified Fairtrade and Organic cotton shower curtain. A second curtain may be necessary as a liner as these have a sheer like texture, but also works well alone for areas with a smaller splash factor. LifeKind – $149.00. Non-toxic and PVC-free. Repels water naturally w/out liner. 100% certified organic cotton canvas. So Well Made – $39.94. For a limited time, this also comes with a free organic cotton hand towel. Choose natural or white. Many of our readers made comments below about the above options being too expensive. Sometimes in life, you’re forced between choosing the lesser of two evils. In this case, if you can’t afford any of the above, then we recommend PEVA (polyethylene vinyl acetate) or EVA (ethylene vinyl acetate) over PVC. While they’re not perfect (made from petroleum; a non-renewable resource and contain chemicals), PEVA and EVA are made from chloride-free vinyl which delivers touchable softness and waterproof function without the smell of traditional PVC vinyl. Both are PVC free, biodegradable, don’t off-gas and are affordable, especially when you can find them at a store like Bed Bath and Beyond that offers coupons pretty consistently. However, buyer beware as a new study published in the Journal of Toxicological Sciences found PEVA toxic to living organisms. Further studies are needed to determine toxicity in humans. You can find these at BedBathstore $3.99+ or Target $9.99+. Styles are also available from West Elm or Pottery Barn for only $12.00. Or, the PEVA liner from Cb2 for $9.95. They’re chloride & odor free and offer a safer alternative to PVC versions. Also, when it comes to liners, steer clear of labels mold or mildew resistant. This means that the product is – or – contains an antimicrobial chemical which interferes with the growth of mold and mildew. It does not mean that the product will kill disease-causing bacteria or provide a health benefit. Remember – shower to shower each day, but keep toxins at bay! Wonderful – thanks for sharing! The products look great. Would love to see some solid naturals added to the line in the future. Hi Tonya! Yes, this is an often overlooked – but VERY important part of the bathroom and your overall health! Thanks for dropping by and leaving a comment Allison! Yes, it’s tricky to find the non-toxic variety in leading retail outlets (plus, so great to support these smaller businesses). Wishing you health + happiness! FYI…Your # 5 option is not bamboo. It is a bamboo design and made from PEVA. Even though PEVA is not chemically PVC, it is still a petroleum product with added antimicrobial chemicals. There are still many unknown, untested and unregulated chemicals in the material. It is more stable chemically, hence the lower odor (VOC’s) but I still would not recommend it to patients in my practice as a Naturopathic Physician. Thanks for dropping by and sharing your thoughts. We do clearly state re: #5 in the description that it is made of chloride-free PEVA vinyl (but will add this to the title for clarity). Thanks Melissa! We’ll be sure to check it out :) Happy (and healthy) showering. I went to Gaim’s website under shower curtain liner and they do not have any such item. 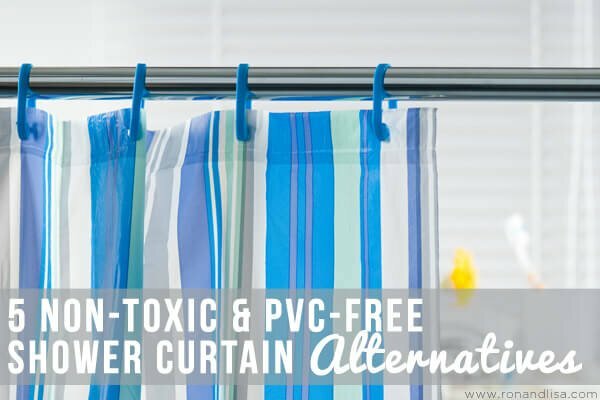 It is not the “curtain” per se that is PVC as they are a type of cloth. It IS the liner. Seems there is no real healthy alternative to plastic liners. Hi Fran! Many times the curtains themselves are plastic and made of PVC. Other times, it is just the liner. Either way, the above points suggest organic fabrics that do NOT require a liner. Alternatively, you can purchase a PVC-free liner as indicated in the last paragraph (and as pointed out in the video) that are made from PEVA – a chloride free alternative. We hope this helps! Correct – thanks for the heads-up! Yes, great suggestion Peter! Just updated post since Gaiam no longer appears to carry these. Hi–the only option here that is affordable for me is the PEVA, but I still don’t like that it’s made from chemicals. What about a fabric shower curtain? Yes, all of the options – with the exception of PEVA – listed above ARE fabric options. These are slightly pricier because they’re all organic (ie: not treated with synthetic pesticides. Learn more HERE). So, if you don’t want any chemicals at all – organic is the best option for you! I just recently purchased a hemp liner and it does get soaking wet, and I wring it out and drape it over the rod to dry—but it does have a funky odor—even after I washed it—-I’m guessing it needs to be washed at least once a week, if not more—which is a bit more upkeep than I was looking for. As open as I am to making changes and willing to spend a “bit more,” your first 4 alternatives are prohibitively expensive. I live in a predominantly Hispanic neighborhood in NYC and know that none of my neighbors, many of whom are struggling financially, could afford to spend $99 and up on a shower curtain. What is available and affordable is at the local discount store. It’s a shame that what is the most healthful, including non-toxic household products and organically grown foods, are beyond the budgets of so many. Yes, some of these are expensive, but consider it an investment in your health. I’ve added a natural cotton shower curtain as less expensive option (which isn’t organic). Or, you could use PEVA or EVA, but thanks to our reader Perla Middleton of ToxicFreeClub, she made us aware of a recent study on PEVA cited above. So, while it’s definitely a better and safer choice than PVC, it still isn’t our number one recommendation. We hope this helps. Remember, the more demand we all make for healthier products and solutions, the more readily (and affordable) they will become! I clicked on your link for earthsake and it connected me to a different company. Do you still recommend earthsake? Yes, we have fixed the link (thanks for letting us know)! We definitely recommend Earthsake! Saved as a favourite, excellent site! I bought the Earthsake hemp shower curtain but am deeply disappointed. They claim that you do not need a liner and it dries fast. Both are not true. The curtain soaked through leaving a big puddle on my bathroom floor and it took over 8 hours to dry even after I wrung it to remove all excess water and let it hang out of the tub to dry. I do not recommend Earthsake. I find a lot of organic, natural products do not end up living up to their marketing claims and being of inferior quality as well. Sorry to hear Kirsi :( We can tell you firsthand that the people at Earthsake our top notch and strive to do the right thing for people & the planet. Have you contacted them? I’m sure they would gladly accept the return. Or, you could try using a PEVA liner with it (you can pick these up for under $10.00 at Target, Bed, Bath & Beyond, etc). Would have to kindly disagree; many organic and natural products are superior to much of the ‘plastic’ junk being produced and causing pollution, harm to our health as well as landfill waste that doesn’t biodegrade. Many times, we just have to be more compassionate and understand these items are not the exact same as their toxic counterparts. Example: it took us a while to get used to nontoxic shaving cream and deodorants, but knowing the harm the toxic versions are loaded with made the decision SOOO worth it. Do you know if PEVA is safe for cats? Thanks for sharing non toxic options! I hope some day they become more affordable. As someone with chemical sensitivities, trying to reduce toxic exposure is extremely expensive. We need better non-toxic options that are actually affordable for the average person/family. I am looking for an organic shower curtain or liner for a 54×78 shower. I am having NO LUCK! Suggestions? Hmm, Earthsake has the largest selection, but I don’t see your size. These are becoming more popular, so hopefully we’ll start to see more options available soon! Keep us posted if you find one & good luck. This trend has bled over into window curtains and even workout clothing and jackets! Not only do these cheap, dangerous non-fabrics cause health issues, but they are aesthetically distasteful. Yes, we would agree with this KayCee! Also, be aware of anything stain-, grease- or water resistant as the nonstick coating on everything from carpets and cookware to fast food wrappers can wreak havoc on our health and the environment from the perfluorinated chemicals. I just bought a nylon shower curtain liner and am trying that! It’s washable too! That’s better than PEVA even right?! That’s great Kelly. Remember, nylon is still a plastic derived from petroleum, but it’s definitely a less toxic alternative to PVC. Be sure there isn’t a chemical finish applied (pay attention you smell an odor). Does anyone, anywhere believe in colour anymore? Every wall in my apartment is chalk gray. White trim. It’s as esthetically pleasing as a jail cell. I want a non-vinyl shower curtain for my bathroom. And what is on offer? Gray, bone white, palest dun, etc. All dead colours. Not helpful. Not attractive. Not shopping here.